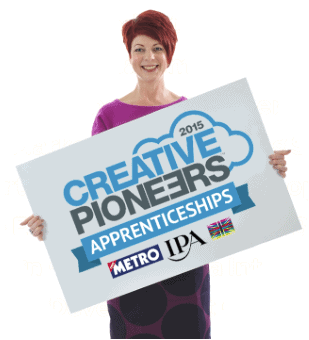 Creative Pioneers is an award winning nationwide campaign to find the next generation of advertising, creative and digital media talent by providing brilliant Apprenticeship opportunities across the Creative and Digital industries. Creativeworld has become the first agency in Lancashire to partner with Creative Pioneers offering young people a unique opportunity to work for the company in a newly created digital apprenticeship role. The new position will be in social media marketing, an area the agency has seen grow from strength to strength in recent years, having been appointed on several large contracts. We are constantly looking to attract the brightest and very best available young talent. People, who can show a keen willingness to learn and listen, demonstrate confidence, have a passion for marketing, and most of all, over time, grow to be a valued member of our team, Team Creative. For the most talented and ambitious school/higher education leavers there’s truly no better place to start your career in marketing. We offer an exciting and challenging place to work, where long term, exceptional careers are built and developed. As a Junior Digital Marketer you will follow a Level 3 Advanced Apprenticeship in Digital Marketing. This exciting role is a stepping stone into the world of digital and traditional marketing, providing support to the current sales and marketing team. To find out more about this exciting new opportunity please contact Andy Lovatt – andy.lovatt@thewhiteroom.co or emails your cv and short cover letter to apprentices@thewhiteroom.co.